Storytime! I Need My Monster! I tell people that I have two jobs – one that feeds my wallet, and the other that feeds my soul. This blog will mostly be about the latter, but I am fortunate enough to have a money- job that feeds into my soul-job. I am currently a “children’s lead” at the local big-box corporate book store. Essentially this means that I’m one of two people in charge of the kid’s department. Working in the kid’s department of a bookstore has two big benefits for me: 1) I get to keep abreast of all the great children’s literature coming out these days and 2) I get to do story time! Now, people think I’m the world’s greatest storytime teller/performer/storytimer. This, of course, is not true. I suspect, however, that people say this because I have 30+ years of experience in live theatre. When I’m doing storytime for the kids I sit on the floor, read the book out loud, and act out all the characters with my upper body and voice. Each book is a little mini-play just waiting to happen. For me it’s one of the easiest parts of the job, and also one of the most rewarding. What I would like to do here is share with you some of my favorite books I read for storytimes. 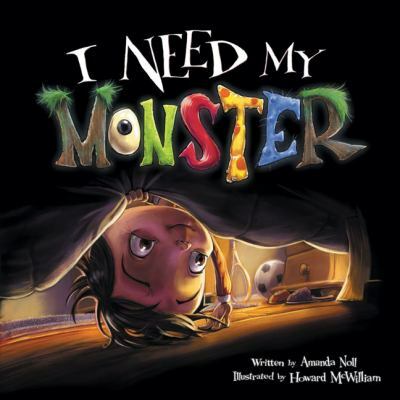 So for my first storytime post I would like to introduce you to I Need My Monster by Amanda Noll and illustrated by Howard McWilliam. I have a handful of “g0-to” books for storytime and this is one of the top five. It’s a great little story about a boy who cannot go to sleep because his monster, Gabe, has gone on vacation. The boy just can’t get to sleep without his monster, so he spends the night interviewing substitute monsters to fill in for Gabe while he is away. Love, love, love this book!! First of all it’s a super simple, silly story with great dialogue between the boy and the various monsters. Each substitute monster falls short of the boy’s expectations because they just quite can’t match up to Gabe. The illustrations are gorgeous and perfect. Each monster begs for a very specific cartoony voice, which in turn makes this book a great read for storytime. And yes, someday I hope to adapt it into a full stage show with puppets. This entry was posted in Storytime and tagged illustrations, kids book, Monster, performance, puppet, puppetry, story time, storytime. Bookmark the permalink. Musings on my new career as a puppeteer and storyteller. A portfolio dedicated to Photoshop work, concept designs, and sketches I have been working on. Bring life with your hands!